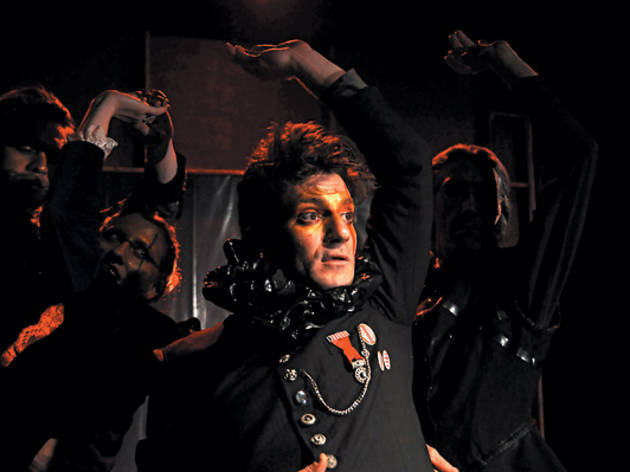 Director Max Truax and composer Jonathan Guillen turn Heiner Muller's postmodern Shakespeare riff into a compelling, jagged-edged chamber opera. 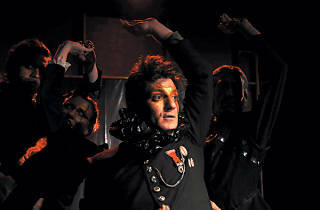 Photograph: Michal Janicki MACHINE POLITICS Antonio Brunetti leads Team Hamlet. Truax’s fascinating new production for Trap Door feels much less cluttered than both Müller’s text and reports of other stagings, but it seems to get directly to Hamletmachine’s spirit. Working with composer Jonathan Guillen, the young director—whose strong recent credits include Brecht’s In the Jungle of Cities for Ka-Tet and Strindberg’s Ghost Sonata at Oracle—has turned Hamletmachine into thoroughly compelling, jagged-edged chamber opera. The director eschews most of the architectural trappings of Müller’s script, instead exploding the author’s words into a libretto for three Hamlets, two Ophelias and one Gertrude, with Guillen’s smartly contrapuntal score filling in the flourishes. As a current riff on a well-known text, this Hamletmachine rivals Black Swan for edgy psychodrama; unlike Aronofsky, though, Truax offers substance to match his style.